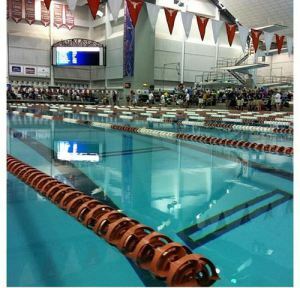 The University of Texas is home to one of the most renowned Olympic-sized competition pools in the world. The Lee and Joe Jamail Texas Swim Center is home to many elite level athletes and hosts nearly 40 national level swim competitions every year. Because of such high traffic, it is important that facilities, such as the locker rooms, are in pristine condition and are ready to withstand the moist and humid environment. In 2007, the Swim Center initiated a month long renovation of the Center's locker rooms. Charles Logan, Director of the Jamail Texas Swim Center stated "Our old metal lockers were plagued with terrible rust issues. My top goals for this renovation were to improve the overall look of the locker room, use sturdy lockers proven to uphold daily wear and tear - even in a moist and harsh area like a swimming area - and, ultimately, increase the overall satisfaction of those who visit our facility." All of the old and rusted metal lockers were replaced with Burnt Orange and White colored Bradley Lenox Lockers. 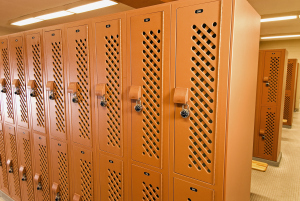 These highly durable lockers were the perfect solution because they are made out of solid high-density polyethylene that is unaffected by by moisture, humidity, chlorine, and even odors! The Jamail Texas Swim Center couldn't be happier with their decisions to install Bradley's Lenox Lockers." Aside from their durability, they were very easy to install because they are shipped in one solid piece so they're ready to go after unpacking. Plus, the lockers have been easy to clean and maintain - markers and dirt can be wiped right off with a rag and regular cleaning solution. Needless to say our staff has been very pleased."